Most of the historical dramas that I've watched on TV have been quite gritty - Poliakoff's 'Closer to the Enemy', and the recent 'SSGB' to name but two. All well and good, but sometimes I just want a happy ending. If you're after a less depressing read that doesn't sacrifice historical accuracy, then The Wedding Girls might appeal to you. This is historical fiction 'light'; there's no swearing, and nothing too horrible happening. There's a huge market in historical fiction for women with a romantic/friendship theme. Walk down the book aisle of any supermarket and you'll see at least half a dozen of this type. I confess it's not my usual cup of tea, as I find that many of these books have chronically transferable storylines that could be set in pretty much any past era, with limited historical accuracy and believability beyond a vague sense of a war or plague or something. Usually the main character is a fallen woman and there's at least one evil older relative and maybe a bosomly mother figure too. This is where Thompson surpasses the average book in this genre; I admire the journalistic groundwork that she did for this book, using her past journalistic experience to complete a thorough piece of research to inform the writing. Thompson interviewed ladies who lived through this particular period of history, and that really shines through in the female characters. It's a very interesting place and time in history that she chose to base the book in, and I think that's a real strength. I genuinely did warm to the characters and enjoy the story, and felt a bit emotional at some of the events described. In the interests of a balanced review, I have to say that I was a bit disappointed that some of the things I disliked about the last book, hadn't been 'fixed' in this one. The male characters were again an after thought, a bit stereotyped as either knights in shining armour or the devil incarnate. Some of the descriptions were on repeat again. On the part of the publishers, again I think the cover is selling the book short (and on this occasion is just plain wrong, being very obviously 1940s when the book is set in the 1930s). The tag line doesn't really reflect the story either, it left me a bit confused. Personally, I'd like to see Thompson change tack slightly and attempt something a little meatier - she's proven her ability to do the historical groundwork necessary to garner that all-too-often lacking 'believability'. That's the hardest bit! I think she's got it in her to add a little grit and take her writing up a notch. Having said that, 'historical fiction light' might be where the money is, so I'd understand if she stuck with it! 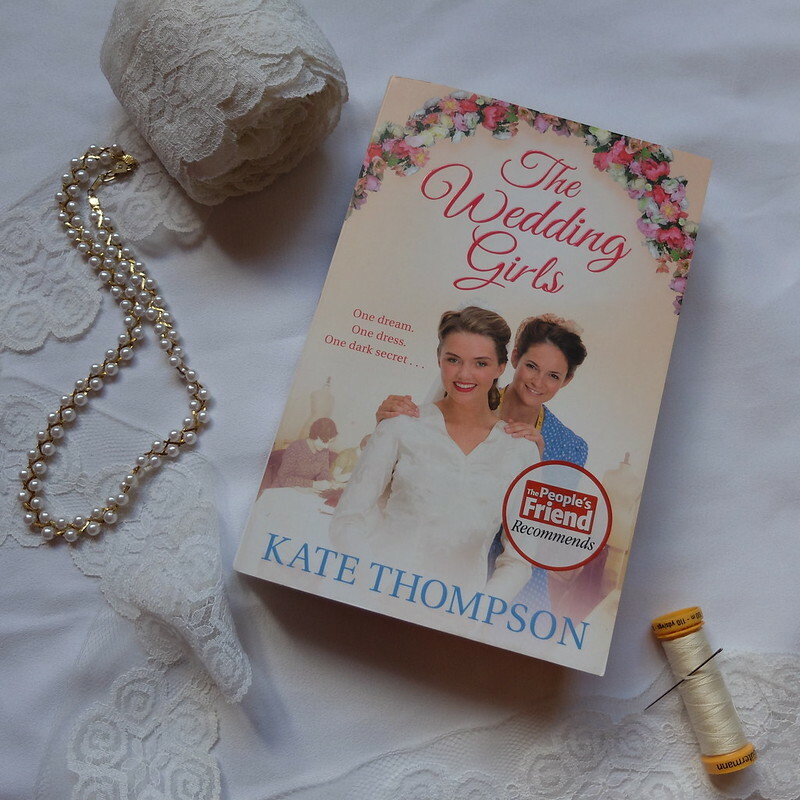 The Wedding Girls by Kate Thompson is published by Pan Macmillan and out tomorrow. I was sent a copy for review. Words and views are my own. I totally agree about that cover! When I first looked at it, I thought this was a book from twenty years ago that you picked up used somewhere. I occasionally enjoy a light book. On a recent flight home after visiting my parents, I needed a book to read. My mom sent me home with a Lyn Andrews book, saying that it was interesting but easy, nothing that would get me down. She was right. It was a quick easy read just right for a plane ride. Not my go-to type of book, but a nice change of pace. In school we used to call these "popcorn books"- they are easy to eat and fill you up, but there is not much "meat" in them :) That being said- I do like to read them sometimes for that very reason! The cover of this one is so bad, but the story sounds rather interesting. I do love a good historical fiction- and especially when the author has done their research too! I don't know if it's my sort of thing, but thinking about it, it's nice to think novels about female friendships are so popular. As you say, there's a lot of grit around at the moment, and it's good to have warmth and something celebrating support. I can definitely get into historical fiction, and I kind of like when, as you said, "nothing too horrible happens," just because there's so much downer fiction out there now and once in a while you need a break from it. And, of course, I don't think that there are nearly enough books out there that just explore friendships and other relationships with women in a realistic way, so good on them for publishing something in that niche. My type of holiday novel for whiling away hours, without much else to do. I will book mark this for future reference.